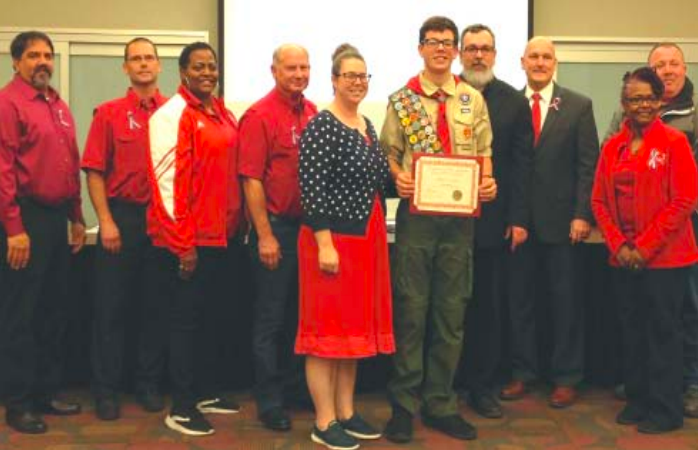 CHS Sophomore, Philip Canada, was awarded his Eagle Scout Rank this past October 9th. The Eagle Scout rank is the Boy Scouts’ highest rank possible and often takes years to achieve. He is active in the JROTC program and credits the program and his parents for encouraging him to be a leader. One of the Eagle Scout requirements is to plan, develop, and give leadership to others in a service project. Philip’s project was to install walkways at a park to facilitate handicap access for park visitors. CROSBY – The school trustee meeting Monday featured a “balanced budget” presented by Superintendent Davis and Chief Financial Officer Jones, as many await a special audit report to show how a financial emergency came to be. The aggregate payroll expenditure went from $4,235,875 in September to $4,098,853 in October. Regarding income, the local tax was unchanged, but the State anticipated interim revenue (from kids attending school) dropped $6,180,541, from $57,453,625 to $52,004,960. The General Fund Budget Amendment 1 is required to reflect the recalculation and verification of revenues and “right-sizing” of expenditures. The amended local tax revenue budget is based on the GCCISD tax revenue forecast, and the state foundation school program revenues are amended to reflect 100% of 2017- 2018 student counts. Expenditures are amended to reflect the decrease in payroll expenses due to the reduction in force as well as other required budget cuts in non-payroll items. The Debt Service Fund Budget Amendment 1 is required to reflect the recalculation and verification of revenues as noted in the above explanation of General Fund Budget Amendment 1. Expenditures are amended to reflect a small increase to estimated debt service fees. The Amended 2018- 2019 General Fund Budget is balanced at $52,004,960, which reflects a decrease of $5,448,665 from the Original 2018-2019 Adopted General Fund Budget. The Amended 2018-2019 Debt Service Fund Budget reflects revenues of $9,596,448, a decrease of $1,409,505 from the Original 2018-2019 Adopted Debt Service Fund Budget, and expenditures of $9,494,273, an increase of $2,001 from the Original 2018-2019 Adopted Debt Service Fund Budget. The Amended 2018-2019 Debt Service Fund Budget reflects an excess of revenues over expenditures of $102,175. Those other costs are being deceased by $2.3 M that could be cut. The decrease is in insurance, utilities, fuel, general fund debt service and resource officers. The upshot of all of this is that the district is counting on over $3.M less revenue from the State, spending substantially less on personnel, and is cutting general expenses while trying to keep operations functional. Federal Revenues are being recalculated down $306,625. The total difference of the new budget is $5,448,665 less revenue. Payroll costs are decreased from 89% to 83% of the General Fund Budget. A full year effect of RIF will bring it to 79% or 80%.